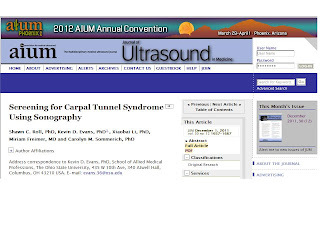 Objectives—The use of sonography in musculoskeletal research and clinical applications is increasing; however, measurement techniques for diagnosing carpal tunnel syndrome with sonography continue to be inconsistent. 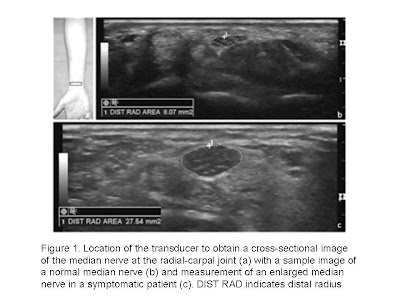 Novel methods of measurement using internal comparisons to identify swelling of the median nerve require investigation and comparison to currently used techniques. Methods—The flattening ratio of the median nerve, bowing of the flexor retinaculum, and cross-sectional area of the median nerve were collected in the forearm, at the radiocarpal joint, and at the level of the pisiform in both symptomatic patients and asymptomatic control participants. Electrodiagnostic testing was completed in symptomatic patients as a diagnostic standard. Results—Median nerve measurements were collected from 166 wrists of symptomatic and asymptomatic participants. The flattening ratio did not show any correlation to electrodiagnostic testing and was identical between both symptomatic and asymptomatic participants. Moderate to strong correlations were noted between electrodiagnostic testing results and sonographic measurements of the cross-sectional area at the pisiform, retinacular bowing, and both the ratio and change of the cross-sectional area between the forearm and pisiform. The area under the curve was large for all receiver operating characteristic curves for each measurement (0.759–0.899), and sensitivity was high (80.4%–82.4%). Measurements of the anteroposterior height (millimeters) and mediolateral width (millimeters) were taken at each of the 3 locations from the inside edge of the echogenic borders of the median nerve. The cross-sectional area (square millimeters) was obtained by a direct trace along the inner rim of the echogenic border of the nerve in each location (Figure 1). 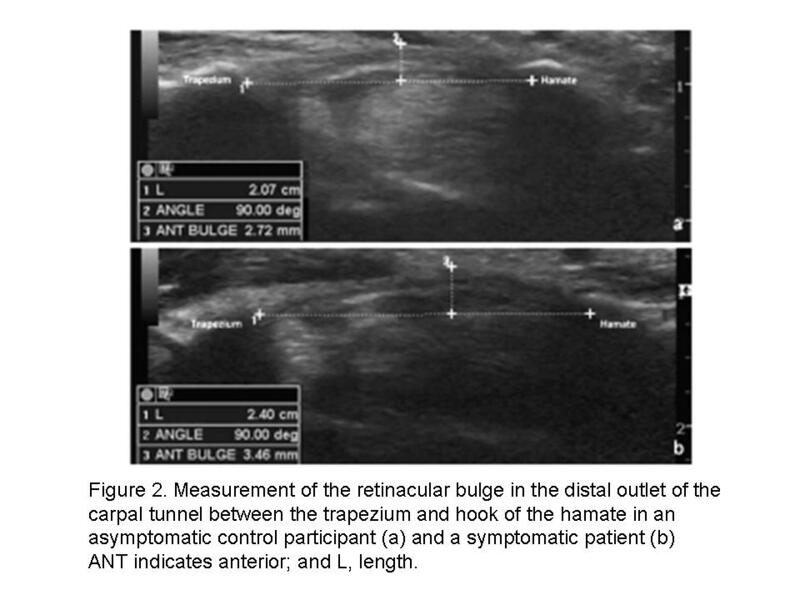 The height of the retinacular bulge was measured as the perpendicular distance from a line connecting the insertion points on the trapezium and hook of the hamate to the anterior-most point of the flexor retinaculum (Figure 2). The flattening ratio was calculated by dividing the width by the height of the nerve in each of the locations. The cross-sectional area in the forearm was used as an internal reference for each participant. Cross-sectional area change scores were calculated as the absolute difference of the cross-sectional area at the distal radius and pisiform from the cross-sectional area in the forearm. The cross-sectional area ratio was calculated for each participant as the cross-sectional area at the distal radius and pisiform each divided by the cross-sectional area in the forearm. Without reducing the image resolution, images were magnified to improve the precision of measurements along the inner echogenic border of the median nerve. Each measurement was repeated 5 times; the highest and lowest measurements were excluded; and the remaining 3 measurements were averaged. Conclusions—Measurement of swelling through a ratio or absolute change had similar diagnostic accuracy as individual measurement of the cross-sectional area within the carpal tunnel. These measures may be useful for improving accuracy in more diverse clinical populations. 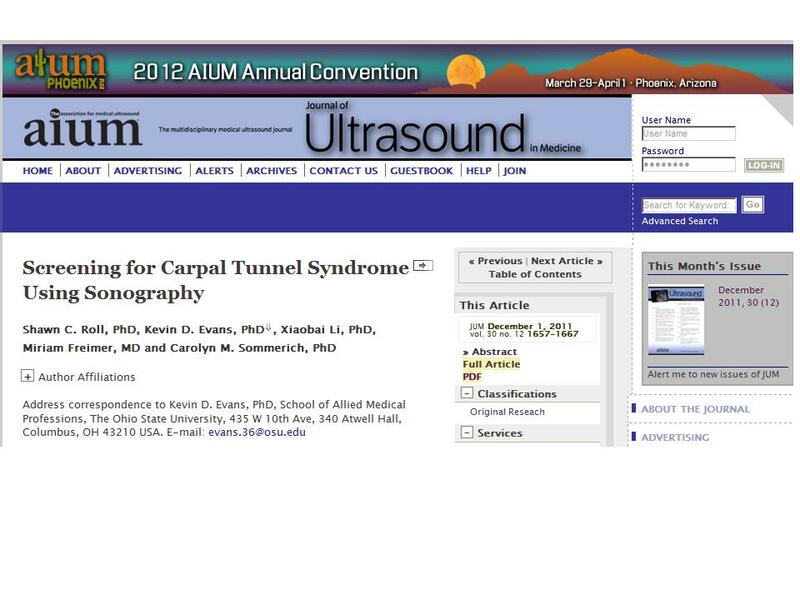 Further refinement of protocols to identify the largest cross-sectional area within the carpal tunnel region and statistical methods to analyze clustered, multilevel outcome data are recommended to improve diagnostics.